In a show of bonhomie, a special border personnel meeting between the Indian Army and China’s People’s Liberation Army (PLA) was held on the Indian side at the historic Nathu La Pass in East Sikkim on Wednesday to jointly celebrate the 72nd Independence Day of India. A report published in the Sikkim Express stated that the celebration at the international border took place in an atmosphere of warmth and friendship, with an aim of enhancing mutual trust and promoting border peace and tranquility. Beside interactions between the two Armies, cultural programmes portraying the rich cultural diversity of the two countries were presented by both sides to celebrate the occasion. 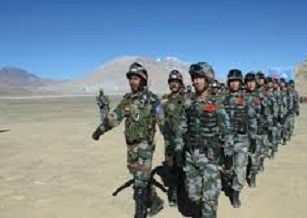 The report further stated that pleasantries were also exchanged in North Sikkim at Kongra La. The participation of PLA is seen as a reciprocal gesture after the Indian Army’s participation on the Founding Day of PLA on August 1 last. “Such interactions between the two Armies have resulted in enhancement of goodwill and mutual understanding between the two nations. Indian Army troops deployed in remote and high altitude areas of North Sikkim also celebrated Independence Day by hoisting the Tricolour at different forward posts with great zeal and enthusiasm,” said a release issued in Siliguri.